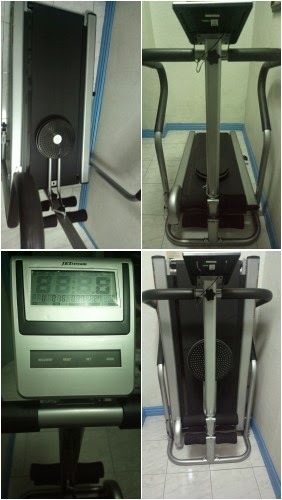 Even a lazy bone like myself will love this Jetstream 3-in-1 treadmill from Toby’s Sports in Greenhills, San Juan because it’s affordable, versatile, and storage friendly. Affordable . This can be the most inexpensive brand new manual treadmill brand I’ve seen on the market so far. And at Toby’s Sports, the item is payable via credit card with up to 6-months installment. The product is also delivered straight to your preferred address. Versatile. You can use it as a treadmill, situp help, and gliding disc. First, although it’s manually operated, you can still set your own pace for walking or running depending on your speed when using it as a treadmill. Next, the added section below the digital display is present to keep your legs in place while performing situps. Lastly, a gliding disc can be used to help trim your waistline. Simply lock it back in place when done. Storage Friendly. Aside from being user friendly with a display showing time, distance, number of calories burned, and pulse rate, it is also storage friendly. The treadmill can be folded to stand to save on space when not in use. I for one, can effortlessly store it in a hallway with limited space. So if you’re looking for the same qualities in a treadmill, the Jetstream 3-in-1 is perfect for you.